Someone from Spectrum please help! I'm a long standing customer of TWC and always had the fastest Internet package available to me. For my work I am in need of high quality Internet connection and I need help getting this resolved. Most "normal" users of the internet would likely never see these issues, but as an online gamer and content creator, it's obvious. Thanks in advance for your assistance. Symptoms: Starting with SB6190, at first it was high latency issues coupled with packet loss. I would run trace routes with high ping results, especially on one specific hop 4. Speeds were never an issue, just line quality. When gaming, high ping makes it impossible to keep up with competition. Also live streaming at sufficient bitrates would cause "lag" and very poor pixelated quality for video feed, making it extremely hard to provide a quality product as a gamer to my audience. 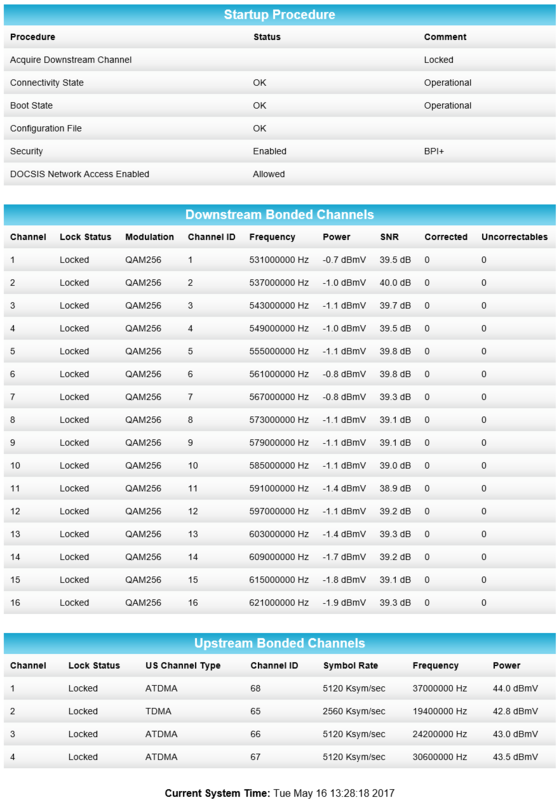 With the SB6190, status page for modem would show thousands of Correctables on downstream bonded channels. Called TWC (at that time) support, tech came and changed some ends on lines at the splitter in my house coming from the drop. Tested all lines and stated everything "looks great" and I should have no issues. I continued to have issues as TWC converted to now Spectrum. I literally wasted weeks just trying to troubleshoot my local network since the tech said everything looked fine. So I determined it MUST be problem with my hardware. 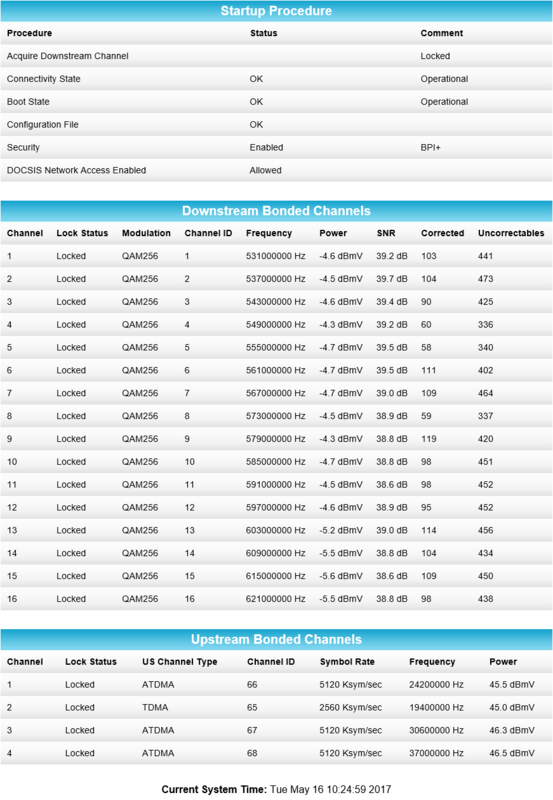 I hooked up a different router that I had and issues persisted. I posted on many forums for help with hardware or possibly the software I was using causing issues, and was recommended to call ISP that there is likely "Noise coming from the node in your area and your ISP needs to find it." So I called Spectrum and went through the whole run around with the CSR to reset hardware, run speed test, blah blah blah. She finally agreed to have a tech come evaluate again. A day before appointment with tech, I discovered through research that there were issues with the SB6190 having latency issues with the Puma chip. I also was recommended and found many high reviews for the SB6183 being a better alternative, especially for internet gaming/live streaming. So the morning the tech was coming, I purchased the SB6183. The tech came, replaced some ends at the splitter again, tested everything and said "everything looks fine, I'm getting a flat line for noise in your house and your next door neighbor" So I asked about noise or issues further out at the node or in this area. The tech replied "I'm not going to go knocking on all the neighbors homes to test their lines". WHAT? So the tech provisioned new modem (SB6183) and I ran a traceroute. The ping numbers improved a ton using the new modem, EXCEPT for that hop 4. Right away the correctables on the modem looked much better. The following is the big indicator (for me) of issues with quality. 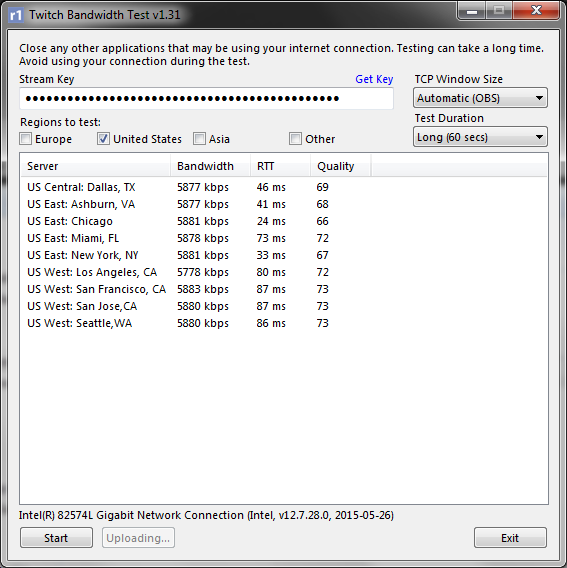 I use a program called "Twitch Test" that basically tests upload speed, ping, and quality to twitch ingest servers for live streaming. 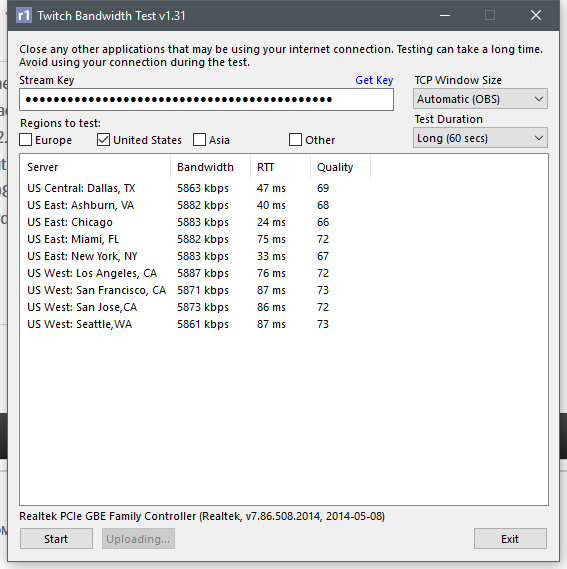 (http://www.teamliquid.net/forum/tech-support/478845-twitchtest-twitch-bandwidth-tester). This is HIGHLY important for my work to have high qualtiy upload to these ingest servers. THOUSANDS of others have no issues (as you can see with the link above) and always get quality in the 90s and above! The goal of this test is to stream to an ingest server with the highest quality results, and generally anything OVER 80 quality is the best to stream to. My results have NEVER gone over 80. Again, speed and pings look great, but the quality of the connection is always 80 or less. Well now the quality numbers have dropped even more, and it is frustrating me cause this is now effecting my income. Again, I was informed to bring these results to my ISP. So I hope someone can please help me get this issue resolved. I need a quality product from Spectrum so that I can provide a quality product to my consumers. I do not want to call support AGAIN and have to go through the whole process over and over. Please get a truck out to my area and fix these issues! I have already had 2 techs here, both stating my wiring is good, I have all new hardware and it is all fine. This is an issues past my house. Side Note: I actually lost about 1 MB speed on my upload recently as well. I received an email from Spectrum saying they "upgraded my speed for free" and as my download speed increased, my upload speed actually decreased. I used to get on average 60 down/6.5 up. Now I get 70 down/ 5.8 up. This is highly disappointing as I need as much upload bandwidth as I can for live streaming. I was very interested in getting the higher speed internet (100 down/10 up) from Spectrum, but extremely disappointed I would have to pay $200 for install fee? That is a deal breaker for me. Increase in monthly payment PLUS $200, it's crazy! I've been really disappointed in the Spectrum merger thus far. I had high hopes good things would come of this, like higher speeds, higher quality, competitive pricing with fiber. It seems Spectrum is attempting the fastest money grab as possible monopolizing on customers that do not have other options yet until Spectrum goes out of business from the increasing growth of fiber network availability. What a shame. TL;DR - Bad internet quality after 2 Spectrum techs signed off that "everything looks good". Please fix! If this is that essential to your business and immediacy is essential you need to hire some techs outside of Spectrum. Are you a rsidential customer? I see splitters inline for a start. Also, you shouldn't be throwing modems at signal issues. Yes residential. Through TWC I was paying for 50/ 5 (actual results around 60/6.5). Now with spectrum when they "upgraded my speed for free" I am paying for 60/6 (actually getting 70/5.8). As far as splitters, the line comes in from street to the intial splitter where it splits to multiple rooms in the house. Then my modem is connected directly to the wall plate in my office. I used to have in line amplifier connected for my office from the drop but techs said my signals were good and did not need it. I was thinking of running a new line to the drop from my office bypassing wall plate, but unsure if that is the issue I'm having or if it will resolve anything. First splitter should be a 2 way with one port going to the modem, the other to a splitter feeding your cable boxes if more than one. You should also be paying for business class, not residential service. The first splitter in your home should be a two-way splitter. One line goes to thh modem. The other line goes to other services in your home (and you will probably need another splitter for that). Using a three or four-way splitter to feed your modem invites signal degredation. You may want to test performance without a splitter at all, and just direct cable from the street to your modem. What kind of coax F-connectors are installed in your wall plates? Hex crimp? Compression? OK great thanks! I do have a 2 way splitter I can hook up. I thought about business class, but this being my home and working from home I did not think it was necessary. I will try the connections as you said, thank you! I believe it is compression connections on wall plate. I will check that as well. Yes, the Spectrum tech set up the 4 way splitter coming from the street that splits signal to 4 rooms in my house. So I have a 2 way I will install first then split to modem and other splitter and cap off the unused port. Thanks again for all the help, I've been going crazy trying to get to the root of my issues! the s/n is slightly better, the levels indeed show a 3.5 dB better connection due to 1 less 2 way split. WE can't see the upstream s/n or errors, they might be quite high from other customers bad connections. I don't think there's enough change to make a difference though. See if there's any improvement.